With over 78% of UK organisations formally adopting at least one cloud-based service over the past few years, UK cloud adoption is well and truly on the rise. As cloud computing becomes increasingly dominant in our increasingly digital world, why is it more important than ever to host and store your data in a British cloud? 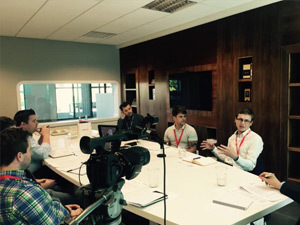 Cloud experts shared their thoughts from our most recent UKFast round table – Lowri has the lowdown! Phil Donoghue, managing director at Cloud4Computers, believes Brits have a unique ownership mentality that most countries do not possess. He said: “Offering a British product is so important to us and it truly means something to businesses. Tomislav Simnett, director at web agency Initforthe, agrees. He believes Britain is a thought-leader in the market, and a place to be proud to host your data. The experts also believe however that the general perception of hackers must change. Nathan agreed. He believes the UK government must see the skill in the hacker’s abilities, rather than the threat. Want to know more? Hear the experts’ views on the key considerations when stepping into the cloud.